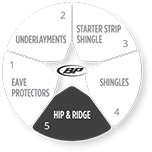 SILHOUETTE is a multi-layered hip & ridge shingle that will add depth to any roof line. It comes preformed in a convenient box, allowing for quick and easy installation, with no cutting required. The special SBS-modified formulation of SILHOUETTE HIP & RIDGE gives it the extra flexibility required to accommodate any angle for a picture-perfect finish. SILHOUETTE HIP & RIDGE is available in a selection of colours carefully selected to complement BP Canada’s existing laminated shingles.